This isn’t a mantra for traders (although maybe that’s not a bad idea), it’s what the stock market tends to do around certain high-profile economic reports—the jobs report, for example, or a Federal Reserve FOMC announcement. We have one of the latter coming today at 2 p.m. ET, so if the market doesn’t do much between now and then, don’t be too surprised. Most traders essentially hold their breath until the potentially market-moving news breaks, at which point oxygen resumes flowing and volatility and volume spike as players flood the market with new orders. The SPX closed down on the June 13 announcement day, closed up the next day, then turned back down for several days. On August 1, the SPX closed down and initially traded significantly lower the next day, but reversed intraday to close up and trade higher over the next three days. ●The day before an FOMC announcement (yesterday) the SPX closed higher 70% of the time. ●On announcement day (today), the SPX rallied from the open to the close only 40% of the time, and closed higher only 47.5% of the time. ●The SPX closed higher the day after FOMC announcements (tomorrow) 52.5% of the time. ●The SPX closed higher two days after FOMC announcements only 42.5% of the time. Just based on these raw percentages, the most notable pattern appears to have been the tendency for the SPX to close up the day before an FOMC announcement—28 out of 40 times. The post-announcement numbers are murkier. In this sample, at least, the market seems to have had a slightly bearish bias after the reports, but nothing too dramatic. So, some traders may think it’s worthwhile to dig deeper into what may happen before an FOMC announcement rather than attempt to predict what happens after it. ●If the SPX closed up the day before announcement day, it closed down on announcement day 61% of the time. ●If the SPX closed down the day before announcement day, it closed up 67% of the time. As has been stressed in this space many times, every trading situation is unique. 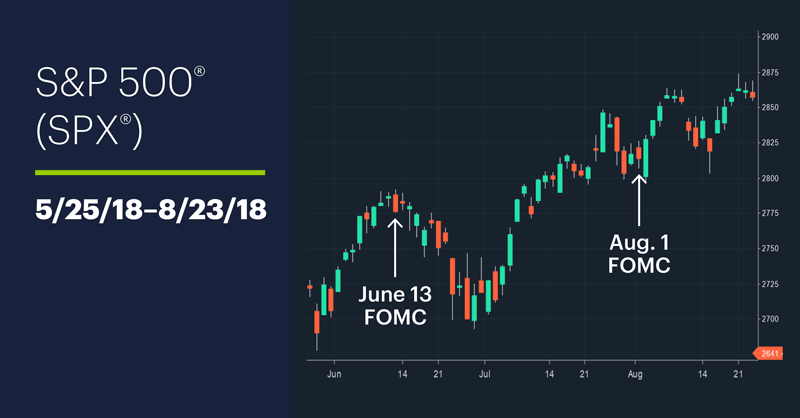 This week, especially—given the number of high-profile earnings schedule for release, along with the US-China trade talks—other events may claim a tighter grip on the market’s collar than the FOMC announcement. If that’s not the case, though, the historical price patterns are worth keeping in mind. Market Mover Update: Yesterday February gold futures (GCG9) rallied to their highest level (above $1,310/ounce) since June 15, 2018. The first two big defense and aerospace stocks to release earnings this week both gained ground yesterday: Rockwell Automation (ROK) rallied more than 6% after beating its headline numbers, while Lockheed Martin (LMT) bounced back from a pre-market loss to close higher on the day after missing its earnings target but topping revenue estimates. Today’s numbers (all times ET): ADP Employment Report (8:15 a.m.), Pending Home Sales Index (10 a.m.), EIA Petroleum Status Report (10:30 a.m.), FOMC Meeting Announcement (2 p.m.). Update: The GDP report scheduled for today has been delayed because of the government shutdown. Today’s earnings include: Alibaba (BABA), AT&T (T), Boeing (BA), Check Point Software (CHKP), General Dynamics (GD), McDonald's (MCD), NASDAQ (NDAQ), Cree (CREE), Facebook (FB), Microsoft (MSFT), Mondelez International (MDLZ), PayPal (PYPL), Qorvo (QRVO), Qualcomm (QCOM), Royal Caribbean (RCL), Tesla (TSLA), U.S. Steel (X), Visa (V), Wynn Resorts (WYNN).